By ordering a product, the customer agrees to purchase the product. We have the right to accept the contract offer, which is part of the order, within two weeks. This acceptance can be done in writing or by delivering the product to the customer. The receipt of orders is always acknowledged by email. This Acknowledgement is not in itself an acceptance of the order. Our prices, offers and bills and statements are always in Euro. Our offers in the internet are non-binding. All prices are gross prices, including German VAT, which is at the moment 19%. 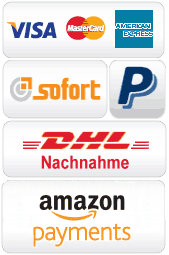 Shipping and handling costs within Germany are calculated according to the current price-list of German Post for insured Air mail and are shown separately. When ordering Charge on Delivery (C.O.D. ), there will be additional costs, in addition to the surcharge, the delivery company may ask for. Changes in Price and errors are reserved. Delivery is usually within 3 to 8 business days. In case the delivery is delayed because of a high demand for a product, you will be informed by email or via telephone about the expected new delivery date. A right for compensation because of a late or not delivered product, exists only according to § 5 Liability of these terms and conditions. In case of delays, which lie outside of our reasonable control, such as strikes, including strikes of our own delivery services, we are released from our duties for the duration of the event, which causes the delay. In case of delays of more than 8 weeks, you have the right to cancel the order. In case we learn of circumstances, after completing the contract, but before delivery, which lead us to doubt the ability of the customer to pay, we have the right to withdraw from the contract, unless the customer agrees to purchase the product with advance payment, or to give acceptable securities. (1) The guarantee right of the customer is according to the laws and regulations. (2) Is the customer not a consumer, such as a business, a juristic person, a juristic body or a person of common law, we only give guarantees according to what the manufacturer of the product offers. Our pre-contractual, contractual and outside contractual liability is limited to intentional misdoing and negligence, unless it is about the contractual requirements or personal injuries. The same applies to the liability of our business partners. The liability according to the product liability law is unaffected. The customer is required to offer truthful information, especially about their address and contact information. We have the right to withdraw from the contract, in case wrong information was given. The ownership of the product is only transferred to the customer only after completion of all required payments resulting from the contract. When acting contrary to the law, especially concerning late payments, we have the right to demand back the product. This taking back of a product does not constitute a withdrawal from the contract, unless explicitly declared in writing. The European Commission provides a platform for online dispute resolutions, which you can find at: http://ec.europa.eu/consumers/odr/. We are not obliged and we are not prepared to participate in procedures for the settlement of disputes with consumer arbitration boards. (1) German law applies under exclusion of the UN customer rights. (2)Is the customer not a consumer, such as a business, a juristic person or a person of common law, our place of business location is exclusive place of jurisdiction, concerning demands that result from this contract. The same applies to persons, who don’t have their place of jurisdiction in Germany, or who may have changed their place of residence into foreign countries, or whose place of residence is not known at the time of the lawsuit. We are also authorized according to § 9 paragraph 2 sub paragraph 1 to sue the customer at his place of residence.